Mary Mary Quite contrary… « T-Bird\’s crafty Blog! how does your garden grow adn all that. Well, here’s how mine is growing just now. 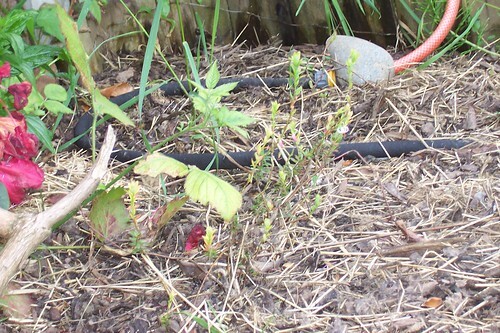 Just next to that is currently a berry patch with cranberries and a plan for bilberries and/or blueberries. They may be moving htough as it’s not teribly sunny until summer in that corner whihc could be why they are so damned straggly. I cloched them this spring for a month or so to get them nice and warm, it seemed to help but now they are flowering they need to be out in the air. At the back of that bed is our rhodi which has just finished flowering so you don’t get the wow factor that it was 2 weeks ago. Duke threatened to rip that out one year, I threatened him with sleeping in the potting shed so he re-thought! and just to prove there is something in that bed….. see? a cranberry plant! 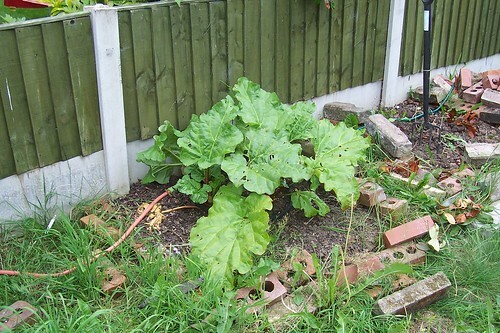 moving round from the berry patch we have the rhubarb which is yum! 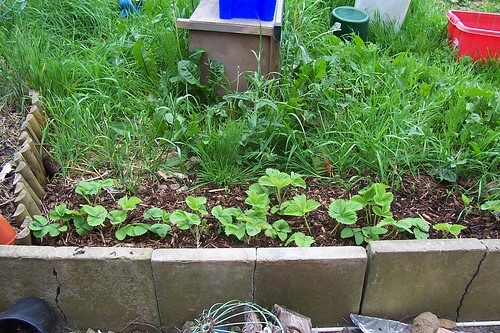 I need to remember to shovel a bit more organic stuff round it this year as the soil is getting a bit depleated and it’s showing in the quality. The next 2 beds are empty but then up against the compost box we hvae peas growing up some prunings from next door’s bush, you are supposed to use twiggy sticks, I figured leafy sticks would do the same job! 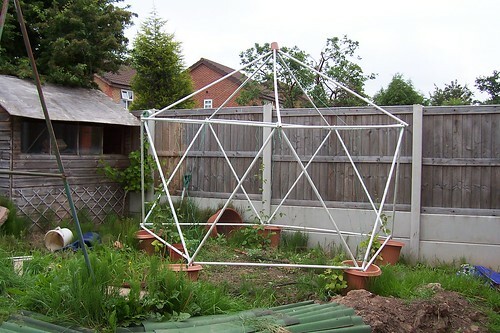 Over the other side of the garden is the bean frame with runner beans legging up hte strings and the bonus of a couple of potato plants that are proof that you really need to leave your compost to rot down totally before spreading it out! 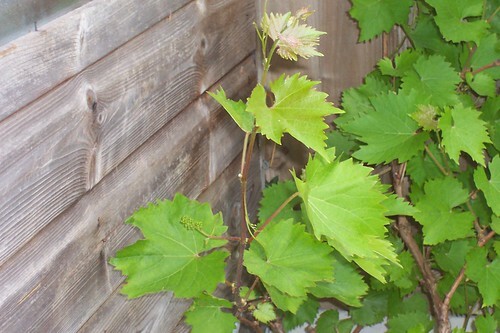 You can also see the grapes growing up the shed. and if you use a bit of imagination there’s a bunch of buds here and there! 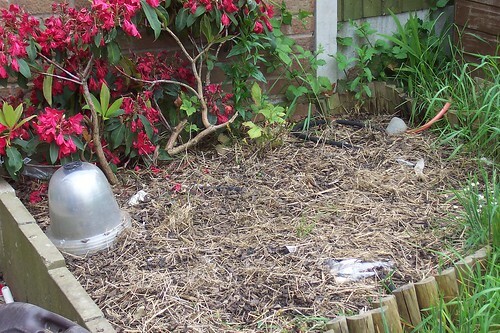 I’ve been given some sprout plants to go in one of the beds so I’ll be doing that this evening, once it’s a bit cooler. I’ll need to add another loop into the leaky pipe system to cover the bed they are going in – last year we had awful crops because just as everything was getting going we went on holiday for a week adn it was a really hot dry spell so th is year we grabbed leaky pipe when it was on offer in Lidl and I’m hoping for great things! This entry was written by tbird and posted on 9 June , 2007 at 4:54 pm and filed under Uncategorized. Bookmark the permalink. Follow any comments here with the RSS feed for this post. Post a comment or leave a trackback: Trackback URL. hmm, you could stock up at ours on the way back from kessie with spare plantlets? oh, and your beanwam must be the fabbest in the universe!! Thanks Helen. I’ll admit to being partial to the beandome myself although three is a sort of blue-ish haze over the garden when I put it up (that plant pot on the to it to remind me which way is up when it all goes wrong!) 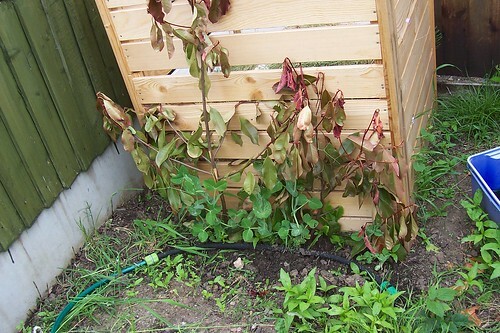 I have high hopes that one year the beans will get going enough to grow over the top – maybe with the enhanced watering regimen they may….